At just over an hour long, it’s story is smart for most of the way through, but the action is mediocre and the ending is left very inconclusive and unresolved. 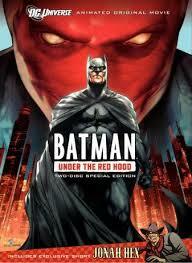 Batman: under the red hood is an animated movie about the dark knight or detective superhero that in many ways tries to be like a graphic novel turned into an anime movie. that means violence and blood and no sugar coating at all. All of this is okay by me. it wants to be a movie that is taken seriously by adults. and it is. that’s the only reason I even heard of it. I suppose it was around the time rumors were being spread about who might be the new villains in the third christopher nolan batman movie, that I read something about how good this movie was. but the truth is, it isn’t really all that great. it’s alright. the story is smart enough. especially in the first half. there’s a new criminal in town. a guy named the red hood. and he’s not only a good fighter, but also resourceful and knowledgeable about how the criminals in gotham operate. he starts moving up the food chain, taking on known bosses while offering protection to others so long as they kick up some of their profits to him. All of this is the usual stuff. every superhero movie features a new villain in town who is suddenly more threatening than any villain who came before him. so where does the plot line get good? In it’s presentation of robin. through flashback we see the joker terrorizing and beating robin. he goes to town on the boy wonder (this is where a lot of the blood comes in), and then he kills him. We learn from conversations between batman and his loyal butler, alfered, that this was the second robin. the first one is still around and kicking somewhere. 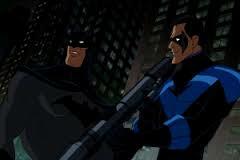 and when batman takes on a giant monster creature in an alley after taking out the goons that were trying to transport it, the old robin shows up, now known as night wing, and wearing a cool blue and black costume. the movie goes on to have both batman and robin take on the red hood and then replay video of what happened during this confrontation to study the way the villain moves and try to figure out his identity. now we see more flashbacks involving the newer robin who was killed by the joker. the flashbacks show how he used to fight, like a scene where he and batman once took on the riddler. I love the way this movie brings in all sorts of villains from the past, or just iconic batman villains. it’s not that they’re all used in a single plot, like a teaming up of batman villains to squash their lifetime enemy or something, but the movie is smarter than that. it shows us the villains in flashbacks and plot twists. there’s the joker, the riddler, the black mask, the red hood, and even ra’s al ghul. I like the way batman has to go to visit ra’s just to get information about something that once happened. similarly, he and robin pay a visit to the joker in prison to question him and try to find answers about what the joker thinks of the new villain on the street, the red hood. it’s very silence of the lambs-like, trying to get help from a criminal in jail. and it works. What doesn’t work is the lack of action. there are a few scenes early on, most notably that scene with the giant monster, but then as the movie continues, it becomes much more plot centered and much less action based. why can’t it be both? I like the attention to the plot, but there has to be a reason why this movie is animated and not live action. if it’s just a detective story about criminals in the mob, and a new criminal, and finding out who he is, than why animate it? You animate in order to do things that could not be easily done on film. like incredible stunts. Aside from the lack of action, the movie is entirely inconclusive. at the end of the dark knight, we were left hanging (literally) on answers to what was going to happen to the joker. this movie has the exact same problem. we get answers about two of the villains involved in the tangles of the plot, through a news report. but we hear nothing about the main villain. he’s still out there, and maybe there’s nothing to stop him from starting up with this whole mess again. Still another problem with the movie is it’s lack of believabiltiy. first, there’s the giant monster who was being transported and ship at the boat yards (like the cargo of poisonous teddy bears batman intercepted in batman begins). there’s no reason for it to be a monster. I realize there had to be something big enough that batman needed nightwing’s help, but how about a giant armed, state of the art, tank or something? And aside from the monster, there are also plot points involving a fountain of youth and life after death reencarnation type stuff. all of that is okay, except for that in the first half the movie seems to want us to take it seriously (well, aside from the monster), and treat it as a detective story more than as fantasy. so why the elements of fantasy later on than? they seem unneccessary. instead of reencarnating a character, for example, why not just say that he wasn’t really dead to begin with and everybody just thought he was? Something like that. the movie is enjoyable and better than the average animated movie because of it’s dark, grim approach and because of it’s flashbacks. those are used so well here that they continually reveal answers and layers of information. there are also some cool villain team-ups here and connections and setting other characters up. the plot is definitely the strongest thing about the movie, even with it’s unresolved ending. the action and believability are the things that could have been a lot better.